Floors Castle was originally a 16th century stone tower house, founded by Robert Ker of Cessford. 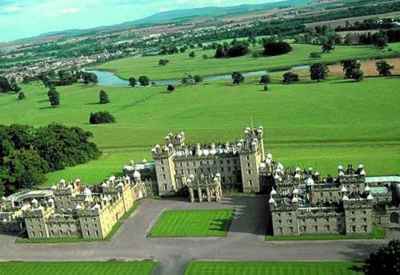 Being a favourite of King James VI he was granted the land, once held by the Abbey of Kelso until the Reformation. In 1721 additions were made to the eastern end of the tower house, creating a plain Georgian country house. In the mid 19th century, the house was absorbed in the construction of a magnificent baronial mansion, with a towered central block and symmetrical ranges. Now the largest inhabited house in Scotland, a holly tree in the grounds marks the spot where King James II was killed by an exploding cannon, while besieging Roxburgh Castle. 5 miles west is Smailholm Tower and 8 miles north-east is Wark Castle. Floors Castle is located north-west of Kelso, off the A6089. 25 miles south-west of Berwick-upon-Tweed, on the B6461-A6089. The site is owned by the Duke and Duchess of Roxburghe and is open daily, Easter Weekend, May to October 11:00-5:00pm, check website for details.